Passionate about hair? Find your summer look with Plainfield Hair Braiding Styles! Braiding your hair is a gorgeous way to keep it neat and maintained for several weeks without taking the time to actually style it every morning. There are numerous styles you can create out of long term corn row braids or box braids, but your fingers can get tired when working on those beautiful, intricate looks. Each stylist is skilled with all ages and hair types. That’s why it is better to find an experienced hair dresser to get your hair looking beautiful, effortlessly. Our stylists ensure a welcome and comfortable environment for you to relax while your hair is being styled. We understand that a woman’s hair is a statement, and we will get you looking confident and beautiful while you take on every day life! It’s about time you treat yourself to a new look. Contact one of our professional stylists to schedule an appointment and get your hair styled to perfection. 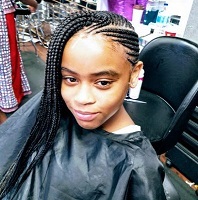 Plainfield Hair Braiding Styles for summer 2018! It’s time to feel confident so you can take on the day and look killer while doing it. This year, what look will you go for? Micro/ Mini Braids – These are usually small, single braids that are braided half-way, leaving the rest of the hair free. This style is very cute relaxed, but can also be dressed up. Goddess Locks – This is an extremely lightweight look with wavier strands to create a slightly weathered and soft braid. Makes you look like a true goddess. Havana Twists – This style is very similar to Marley Twists, but Havana twists are double sometimes even triple the size of a single Marley twist. Corn Row Dutch Braids – The dutch braids are back! This simple hairstyle frames your head beautifully, being sure to attract attention wherever you go. Big corn rows into a ponytail – You have the ability to rock a number of complex and intricate designs, so why not take full advantage of that? We love big corn rows pulled back into a simple ponytail, a professional look for when you’ve got a busy day. 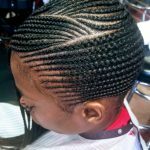 Dynamic Side Swept Cornrows – This professional chic look will have you looking gorgeous on any occasion by sweeping your beautiful braids to one side. Box / Janet Braids – Recently, these braids has come back in style as Boho chic and very popular for summer 2018. Turn heads with this cute style. Incorporate jewelry to make it a real eye catcher. Crochet Braids – The crochet braids are adorable and follows a sweet 90’s vibe. Rope Twists – These are a simple, bold, beautiful style that’s cute year round! Rope braids never go out of style. Mohawk Braids – The mohawk braid is a stunning and very trendy, this edgy hairstyle is hot this year, by creating a faux mohawk with your beautiful braids! Why Choose our Plainfield Hair Braiding Styles? Whatever you long for, whether its traditional dreadlocks that last for years, unique twists and up do’s, or one of Plainfield’s Hair Braiding styles, our hairstylists are here to help. Like a certain look? Bring in a photo and we will be able to accomplish it for you. Our salon has offered the most relaxing environment possible for over 15 years. We guarantee the quality of all the styles we offer. If your braids fall out within 3 days after the appointment while following the care instructions that we provide, then we will redo your braids for free. We take pride in all our work, we want you to believe in Ramas just as much as we do. Even though your appointment may be lengthy, we will be sure to make your stay as comfortable as possible. We are aware there are many options when it comes to salons that you can trust your hair with, but Ramas has quality staff, trained and ready to work on any hair type. We understand that your hair can dictate a lot of things, we want your hair to make you radiant. And, in that case, we ask each of our clients to schedule a consultative appointment. During this appointment we will go over your hair type, and what may be the best hairstyle for you. We want your style to last! Once you visit our salon, you become family. Schedule with a Plainfield Hair Braiding Stylist today!